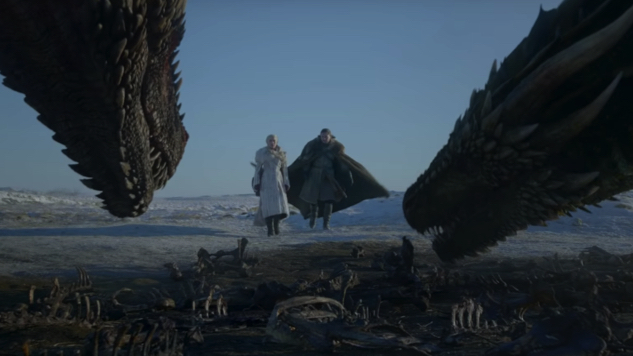 The first full trailer for Game of Thrones’ eighth and final season was released Tuesday, zeroing in on the showdown between the living (fire) and the dead (ice). HBO’s epic fantasy series returns for its grand finale on April 14 as the King in the North Jon Snow (Kit Harrington), Mother of Dragons Daenerys Targaryen (Emilia Clarke), the Unsullied army and various warriors of Westeros team up to vanquish the Night King and the White Walkers. The trailer teases that Jaime Lannister (Nikolaj Coster-Waldau) will join forces with the Starks, as well (“I promised to fight for the living. I intend to keep that promise.”), while Cersei (Lena Headey) performs her usual sips-wine-and-looks-evil routine. Nearly every character we care about is given a split second of screen time to remind us they’re still alive (for now), from Gendry (Joe Dempsie) to Missandei (Nathalie Emmanuel) to the Onion Knight (Liam Cunningham). There’s not much more to the trailer than that; the lead-up to the Battle of Winterfell takes up most of the two-minute video. That’s not a negative thing, either—after all, the battle reportedly took 55 straight nights to shoot. This is what Game of Thrones has been building up to over the course of its seven (occasionally bloated) seasons. We’re ready. Watch the trailer for Game of Thrones season eight below and check out the enigmatic previously released teaser here. You can also catch up on everything we know about Game of Thrones season eight here and hey, while you’re at it, enjoy these first-look photos that tell us nothing about the final season.